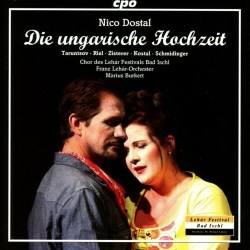 It is fair to say that Nico Dostal’s Die ungarische Hochzeit marks the end of an epoch – that of the Viennese operetta. While Dostal continued to compose stage works after 1939, when this operetta was premiered, but by then the genre was already in decline. Lehár’s last operetta, Giuditta, opened at the Vienna State Opera in 1934 and, being his most ambitious work and closer to traditional opera, it could also be seen as a swan-song. Dostal’s work is more of a trip down memory lane, deeply rooted in the style of his great predecessors: Lehár, Kálmán and even as far back as Johann Strauss II, whose Zigeunerbaron can be seen as its model in musical terms. The Hungarian heritage is very prominent in Dostal’s music but the Viennese waltz is also present and Dostal has a gift for catchy melodies. Some of the best are presented briefly in the overture, where we also can establish that he is no mean orchestrator. There are some purely orchestral numbers, including a long portion full of high spirits in the first act finale, where he also employs the cimbalom as seasoning. The opening of act III is a beautiful slow piece with cello solo and it is followed by a boisterous Hungarian march. A recurring feature is the melodrama, spoken dialogue over music, which can be very efficient. Several of the roles are taken by actors, the most important being Empress Maria Theresia, who appears towards the end as a deus ex machina and sorts things out. She arrives heralded by trumpet fanfares and the role is marvellously interpreted by Dolores Schmidinger, who has been a member of the Vienna Volkstheater since 1965. She has appeared in numerous movies and TV-programmes. She is also a stage director. There are the usual spoken dialogues, quite a lot of them in fact, and without a libretto you have to be fairly fluent in German to keep up. There are few solo songs: Janka, the female lead, has two and there are some more but there are duets and several ensembles, of which the extended finales to acts I and II are highlights. The plot is complicated and unlikely. In a little village three hundred colonists are waiting to be married to young brides fulfilling a promise from the authorities. The village judge sees a profit in marrying off widows and old ladies instead. The Empress wants Count Stefan to go there but he sends his uncle and his valet. Later he changes his mind and goes there in disguise. Thirteen girls from the village are presented to the “Count”, including Etelka, who falls in love with the “Count”. The real Count flirts with Janka. A date for the wedding is set for the next day. Through Stefan’s uncle, Janka’s parents learn the truth and Janka feels cheated. She sends her servant Anna in her place for the wedding ceremony and, naturally enough, Stefan is disappointed. So for that matter is Etelka when she learns that her “Count” is just a valet. Empress Maria Theresia then interferes and annuls the marriages, except those of Etelka and Árpád. In the end Count Stefan and Janka find that they are meant for each other. The singing in this recording is good without being exceptional. The secondary couple Etelka and Árpád, sung by Anna-Sophie Kostal and Thomas Zisterer are lively and charming and have a nice duet towards the end of act I (CD 1 tr. 19). Jevgenij Taruntsov as Count Stefan grows vocally throughout the performance. His song in the last act is both warmly lyrical and glowing (CD 2 tr. 15) but the real star is Regina Riel as Janka. She has a bright lyrical soprano which can expand quite brilliantly at climaxes and has definite prima donna character. Her entrance song (CD 1 tr. 9) is catchy, the duets with Count Stefan (CD 1 tr. 17) and (CD 2 tr. 5) are excellent. The latter takes the form of an enchanting waltz. Her beautiful romanze (CD 2 tr. 9) is probably the number that will be best remembered. Without being a true masterpiece like the best efforts from Strauss, Lehár and Kálmán, Die ungarische Hochzeit is a melodious and high-spirited operetta with several attractive numbers. With the excellent Regina Riel in the female lead operetta lovers – how many are we today – will find quite a lot to enjoy. The lack of libretto and with a fairly meagre synopsis are drawbacks but the music numbers can be savoured. A nice addition to the catalogue.